Kim Woo Bin and Shin Min Ah's relationship was a topic of conversation on the January 15 airing of Channel A's 'Heard It Through the Grapevine'. 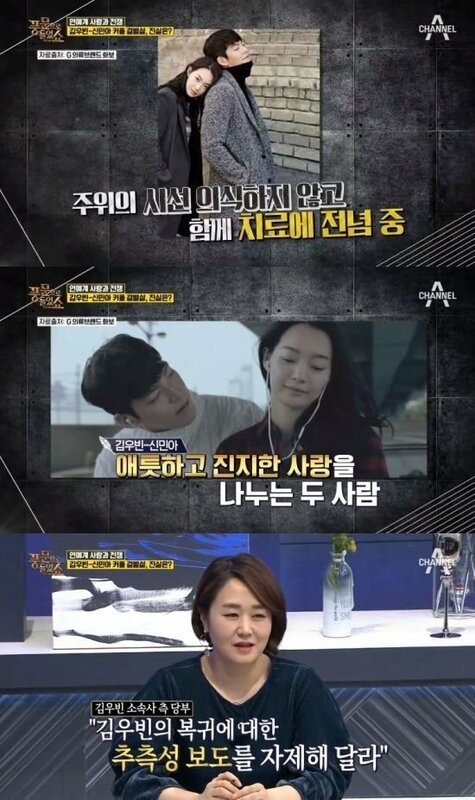 One report first stated, "I heard Shin Min Ah follows Kim Woo Bin to the hospital whenever she doesn't have a schedule. I think it's beautiful how she takes care of him without minding her surroundings." The panelists then asked about the couple's breakup rumors. On this, another reporter stated, "From what I heard recently, Shin Min Ah is still taking good care of him and they have not broken up." Another report added, "They've been dating about 2 years and there are no issues in their love life. They're like a romance novel; a girlfriend who takes care of her ill boyfriend. I think (his illness) is also how they're able to deepen their love more sincerely." Currently, Kim Woo Bin is receiving treatment for nasopharyngeal cancer.